You use the Nightscout uploader app. You use the xDrip uploader app. You use a Nightscout site (viewing in a browser or using a Nightscout Pebble watchface). Nightscout uploader users: switch to REST API and update your Nightscout site (if necessary). 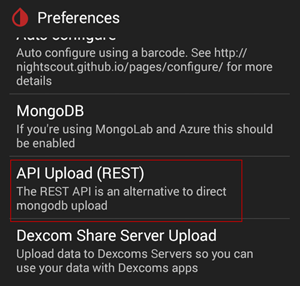 xDrip users: switch to REST API and update your Nightscout site (if necessary). Nightscout Bridge users: update your Nightscout site. Please read each section below to determine the changes you need to make. Even if you have already updated one thing (like your site), you may still need to take other steps (like switching to REST API). You can make these changes at any time it is convenient before September 30, 2015. If you do not make the required changes before September 30, your site may not work after that point. We recommend that you do not wait. Users of both xDrip and the Nightscout uploader app need to switch to REST API as the upload method to ensure Nightscout will continue working after 9/30/15. REST API offers several advantages, including the use of HTTPS, which improves privacy by encrypting the data sent from your uploader phone to your website. REST API also works better on WiFi networks where firewalls may block access to MongoDB upload ports (e.g., schools, hotels, and public hotspots). NOTE: After you switch to REST API, you need to turn OFF your MongoDB upload in your uploader in order to see if your change works. Set an API_SECRET value in your site (Azure or Heroku) settings, if you do not already have one. Your API_SECRET must be 12 characters minimum. (Care Portal users already have an API_SECRET set.) You will need to go to Configure/Connection Strings to add this variable. After adding the API_SECRET, be sure you save the altered settings. 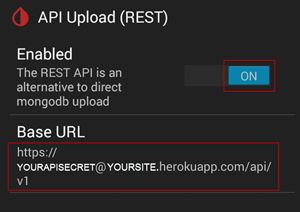 Configure the BASE URL for REST API on your uploader. RECOMMENDED: You can use the auto configure tool to properly format your REST API string for your uploader. 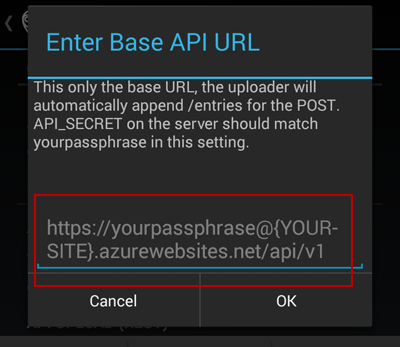 In the Nightscout uploader app, turn the API UPLOAD (REST) option “ON” (in preferences), and tap the BASE URL section to open a popup screen in which you can enter the BASE URL (using the syntax shown above for your Azure or Heroku site). Turn the option “ON” and fill in the BASE URL (using the syntax shown above for your Azure or Heroku site). Wait a few minutes and make sure that your site is updating normally (e.g., ensure your site gets new data with MongoDB off). For additional directions to configure REST API, including how to set the API_SECRET for your site, see REST API – How to upgrade to the new upload technique. If you are having trouble with your REST API configuration, see these troubleshooting tips. Nightscout sites deployed after Jan 21, 2015 should continue to work after the Mongo 3 change happens. This means if you are running Funnel Cake, Enchilada, or Dreamsicle 0.6.1 or newer, your site should have an appropriate driver to support Mongo 3. Even if you decide not to update to Funnel Cake, this does NOT mean you do not need to take other steps to be prepared for Mongo 3. PLEASE SEE THE REST API SECTION ABOVE. The Funnel Cake code contains a newer mongodb driver, so updating to Funnel Cake is a recommended step. Step-by-step directions to update your site can be found here. After updating, be sure and explore new Funnel Cake features and options. 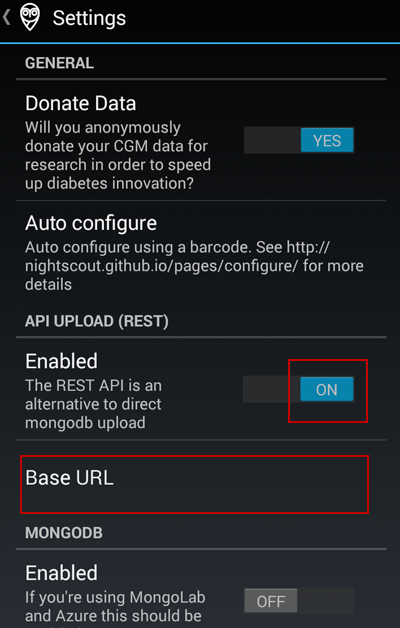 The current version of the Nightscout uploader app will not work with Mongo 3 if you upload using the mongodb method. Updating to REST API (see above) is required. UPDATED! xDrip will not currently work with Mongo 3. Updating to REST API (see above) is required. If you use Nightscout to view your iOS/Share data, you do need to read through the information below and ensure your site is up to date. You do not need to alter your upload method (e.g., REST API does not pertain to you). If you either Nightwidget or Nightwatch, please read the information below regarding those. Unless you installed Nightwidget after October 2, 2015, the version of Nightwidget you have will not work with Mongo 3. An updated version is now available. You will need to download the update and then follow directions to configure it to work with Mongo 3. Nightwatch will work with Mongo 3. Nightwatch can be used as a viewer, a widget, or with an AndroidWear watch.